Dream Penthouse - 7* Luxury, designer furnished, panoramic views! This property sits majestically at the top of this exclusive Golf Resort commanding the very best panoramic views over the mountains, lake, golf course, coastlines of Spain and North Africa and also Gibraltar! Perfect for families, couples and golfers seeking luxurious accommodation in a beautiful location and close to every position amenity with two large sunny south facing terraces with all day sun! Casa Romero is a spectacular and beautiful property with ivory inlaid marble flooring and built in climate control air conditioning throughout. 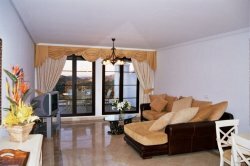 Exquisitively furnished and maintained to a very high standard - a very elegant and comfortable property! One of its main features are its BREATHTAKING PANORAMIC VIEWS enjoyed from every corner - definitely the best location on this exclusive Golf Resort! Two very sunny terraces with wall mounted awning to offer shade over the dining area. Large glass and sand coloured wrought iron table with matching chairs � the perfect spot to enjoy a glass of wine or steak cooked on the gas barbeque. Two matching sun loungers with wheels for easy maneuverability. Master suite � with king sized bed and wrought iron bedstead with four poster ivory canopy. Sumptuous soft furnishings voiles and drapes. (Safe for valuables). Lovely private terrace with fantastic views. Luxury fully tiled ENSUITE BATHROOM with twin basins inlaid into oak vanity units, heated towel rail, bidet and wc. Enormous Sitting Room with comfortable Leather Suite and beautiful mediterannean coloured soft furnishings, drapes and voiles. SKY SATELLITE AND TELEPHONE. Dining Area with large creamy lemon dining suite. Large colour TV with DVD and CD Player. Underground garage � lift and stairs and pedestrian access to property. This beautiful property sits majestically actually on the Golf Course with fabulous views over the Mediterranean coastline and foothills of the Sierra Blanca mountains. A truly privileged spot. The lovely beaches of this region are within a 10 minute drive together with the famous Marina of Puerto Banus and Cosmopolitan Marbella with its cobbled streets, elegant shops, bars and beautiful "Orange Square" where you will find lots of great restaurants! 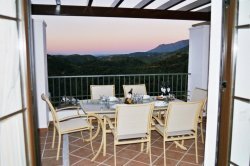 It you are seeking the more traditional side of Spain you are in a perfect location for the many historical sites and the idyllic white washed mountain villages renowned in this area of Andalucia. Picturesque Ronda which nestles over the great gorge and boasts the oldest Bullring in Spain is only an hour's drive. Duty Free Gibralter is less than an hour's drive and historical Granada, Cordoba and Seville are easy day trips along with Tangiers in Morocco via the Ferry from Algecirus. There is something for everyone no matter what age!